SkyCraft first began accepting orders for the SD-1 Minisport in July of 2013, with deposits at an introductory price of $2,000. In anticipation of its FAA audit to ensure compliance with ASTM Standards for Light Sport Aircraft, SkyCraft is switching the SD-1 Minisport from its introductory deposit price to its production deposit price of $5,000. This change will come into effect on August 18th, 2014. This will give prospective buyers a week to take advantage of the initial deposit amount of $2,000. Following a very successful EAA Airventure at Oshkosh, SkyCraft’s estimated lead time for an SD-1 Minisport is now 8 months, with first deliveries expected to be made this winter. SkyCraft hopes to knock this lead time down by 1-2 months by the end of 2015, with the goal of producing 100 airplanes a year starting in 2016. SkyCraft Declares Light Sport Compliance, Purchases New Factory in Utah. Last month, SkyCraft Airplanes declared to the FAA that its SD-1 Minisport is compliant with all ASTM regulations for Light Sport Aircraft—one year after publicly announcing it would be producing the airplane ready to fly. SkyCraft now awaits an FAA audit, after which it will be able to make its first aircraft deliveries to its eagerly awaiting customers. The FAA has scheduled SkyCraft’s audit for two months from now. Over the last year, SkyCraft has made several upgrades and refinements to the design for the SD-1 Minisport. Most recently, the mechanical brakes on the SD-1 were replaced with a stronger, smoother hydraulic brake system, which will shorten the landing distance of the aircraft and improve taxi operations. Historically, many airplane manufacturers have struggled to keep their initial price point during these developmental stages of production, however SkyCraft has been able to maintain its highly impressive $54,850 price tag for the SD-1 Minisport even with the many improvements that have been made. SkyCraft remains committed to the quality and affordability of its airplanes. In preparation for increased production after certification, SkyCraft has purchased a new factory and hangar at KPVU in Provo, Utah. The new facility will triple the production space from the current factory, allowing enough room to build 100 SD-1 Minisports per year. The additional space will be used to expand the production line for the SD-1 Minisport and to continue development of future aircraft models. SkyCraft will be displaying a flying aircraft publicly for the first time at EAA Airventure Oshkosh later this month. SkyCraft Completes Flight Test Program for SD-1 Minisport. After a long winter and spring dodging the Utah weather, SkyCraft’s SD-1 Minisport has completed flight testing successfully, meeting all the performance requirements needed for S-LSA Certification. The plane was found to have good longitudinal and latitudinal stability and exhibited no issues with flutter, vibrations, or dangerous stall/spin tendencies. SkyCraft was able to verify the highly impressive performance specifications for the SD-1 achieved by its Czech designers. Updated specifications are now available on the SD-1 Minisport page. In addition to ensuring the aircraft’s compliance with ASTM standards, SkyCraft’s Flight Test Program focused on the pilot experience of flying the SD-1 Minisport. Based on flight testing reports, SkyCraft will be updating the interior layout of the aircraft prior to delivery to customers. The most significant change will be the elimination of the MGL gauges for a more fully integrated Dynon setup. This cleaner instrument panel will make the SD-1 more user-friendly and will also allow the aircraft to take advantage of more of the Dynon glass cockpit capabilities. This change also makes the airplane safer since the Dynon SkyView is backed up with a 2-hour emergency power supply. SkyCraft is committed to delivering a safe, comfortable, and fun flying experience, and we are now fully confident that the SD-1 Minisport provides exactly this. Completion of flight testing is a significant achievement in SkyCraft’s ultimate goal of certifying the SD-1 Minisport as an S-LSA aircraft. With the performance, design, and production of the SD-1 all ASTM-compliant, SkyCraft is very close to achieving its goal. Financing Now Available for the SD-1 Minisport. Our mission at SkyCraft is to bring the joy and freedom of flying to as many people as possible. The biggest challenge with this goal is bringing the cost of flying down without compromising on the performance or safety of the aircraft. SkyCraft has been able to release the SD-1 Minisport at a price that is an LSA-best for affordability, standard with top-of-the-line features. The SD-1 has made strides in reducing operational costs as well with its exceptional fuel efficiency, removable wings for trailer storage, low insurance costs, free engine and propeller overhauls, and ability to run on unleaded automotive gas. Continuing this trend, SkyCraft is happy to announce that the SD-1 Minisport can be financed at terms that make it more affordable than ever. With a 50% down payment on an aircraft, the SD-1 can now be financed for as low as 4.5% APR with terms up to 6 years. This allows buyers to own the SD-1 Minisport for as little as $475 a month. For an SD-1 equipped with the optional Ballistic Parachute and Mode S Transponder, minimum monthly payments are $530 a month. Current lead times between deposit and delivery of the SD-1 are 3-4 months. Aircraft production at SkyCraft is well underway, with deliveries pending S-LSA certification. SkyCraft Airplanes Now Accepting Bitcoin Payments. The digital cryptocurrency Bitcoin has gradually gained traction over the last few years as a viable payment method for goods and services online. Just in the past few months, the number of companies accepting Bitcoin has jumped following an explosion in the value and popularity of Bitcoin. At SkyCraft, we have watched the development of the currency closely, and we are now ready to accept payments for our airplanes in Bitcoin. The General Aviation industry has struggled in recent decades with increasing costs, outdated technology, and an aging pilot population. These issues are the basis of SkyCraft’s mission – to bring safe, affordable, high performance flight to everyone. We have succeeded already in building the most affordable Light Sport Aircraft on the market; equipped with the latest in aviation technology and designed with impressive performance and safety features. Our decision to accept Bitcoin is fueled by our desire to bring General Aviation into the 21st century, and to spark interest in flying to Bitcoin holders who may not have already become familiar with its beauty. The SkyCraft SD-1 Minisport is the first aircraft that can be bought with Bitcoin. At the current exchange rate, the SD-1 can be purchased for just under 80 BTC, with only a 2.85 BTC deposit required to hold a production slot. All Bitcoin transactions are securely processed using Bitpay through the Buy A Plane page. We hope this will signify an important moment for both the future of General Aviation and the future of Bitcoin. Ethanol-Resistant Fuel System Added to the SD-1. The SD-1 Minisport already burns less fuel than any other Light Sport Aircraft – just 1.8 gph. Since it runs on 91-octane automotive gas, the SD-1’s operational cost is just $12 an hour factoring in fuel, oil, and overhaul. Until now however, the SD-1 has only been able to use ethanol-free gasoline. In many places, ethanol-free gasoline can be inconvenient to obtain. In order to allow for the most convenient and affordable fueling options, SkyCraft has re-equipped the SD-1 Minisport with a fuel system that is resistant to ethanol. Pilots will now be able to fill the SD-1 with premium unleaded from any gas station. For cross-country flights that require refueling at an airport, the SD-1 can still run on 100LL avgas with a TCP additive. This gives pilots maximum flexibility when filling their aircraft. SD-1 Insurable for Under $20 a Month. The SD-1 Minisport has been widely recognized for its groundbreaking affordability in both initial and operational costs. Recently SkyCraft added to this record by offering a free 500-hour top-end engine overhaul, as well as a free 600-hour propeller replacement. SkyCraft is now pleased to announce that the SD-1 Minisport can be insured with minimum liability coverage totaling just $200 a year, which covers up to $1,000,000 in bodily injury and property damage. This adds only $2.50 an hour to the plane’s real cost of ownership based on 80 hours a year flown by the average S-LSA. Complete hull coverage can be added for $1,375 a year, putting the monthly cost of a fully covered SD-1 at just over $130. The checkout process for the SD-1 Minisport is simple due to its highly docile and forgiving flight characteristics. Those looking to insure themselves in a tailwheel SD-1 will need 25 hours in a similar tailwheel aircraft, while those checking out for the tri-gear configuration will need an endorsement to competency in a similar light aircraft. The SD-1 Minisport requires very little specialized instruction due to its simple controls and predictable flight behavior. 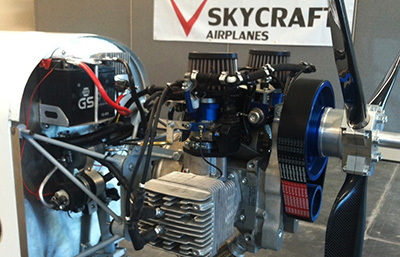 SkyCraft has worked hard towards its mission of creating a truly affordable, high performance aircraft. The ease and cost of insurance is yet another victory in this mission. SD-1 Minisport Available for Download on X-Plane. For those itching to get a taste of what it feels like to cruise around in the SkyCraft SD-1 Minisport, we’ve made the plane available for free download on the flight simulator program X-Plane. Thanks to its hyper-realistic physics modeling, X-Plane gives a great feel for the SD-1’s impeccable responsiveness, handling, climb, and stall characteristics. The flight simulator serves well as both an accessible way to test fly the plane, and also as a training tool for preparing to fly your own SD-1 Minisport. See you at 2013 EAA Airventure Oshkosh! 2013 EAA Airventure Oshkosh will be taking place July 29 through August 4, and SkyCraft will be there with its airplanes on display publicly for the first time. SkyCraft will be accepting orders for the SD-1 Minisport at the show with expected fulfillment in 2014. Orders will also be accepted online at the same time for the rest of the world as well. Pre-orders on the SD-1 have already filled production slots for the remainder of 2013. SkyCraft is excited to be sharing its SD-1 Minisport with the world, and will be hosting giveaways, special offers, and free simulated flights on the SD-1 at its booth in celebration of its launch. If you’re around, come check out the exhibit at booths 92 and 93 right near the main entrance. We’ll see you there! SkyCraft Begins Production on SD-1 Minisport. SkyCraft Airplanes began production of their SD-1 Minisport on May 13, which will be available for order as an S-LSA starting in July. The SD-1 boasts impressive performance specs; with a 118 mph cruise speed, 1400 fpm climb rate, 39 mph stall speed, and 5 hours of endurance. The price of the SD-1 is set at $54,850. This, combined with its impressive $12/hour operational cost (fuel, oil, and overhaul included) and removable wings, makes the SD-1 the most affordable LSA on the market.